Communicate hands-free on your mobile phone, with less interference from surrounding sounds. 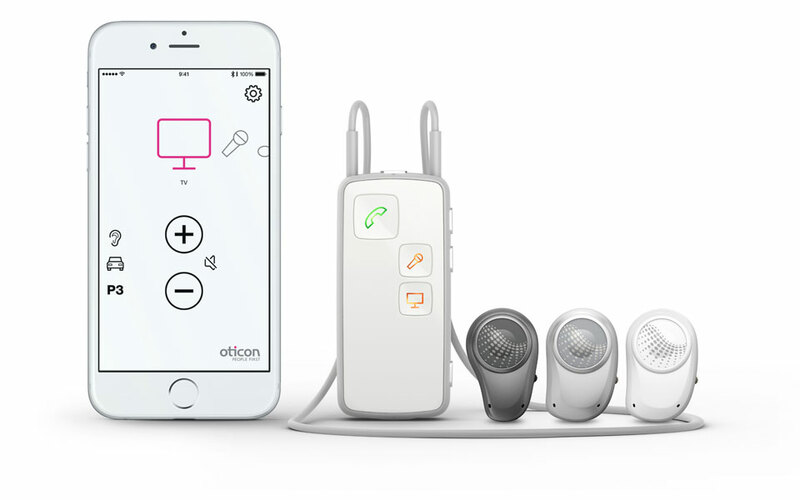 The Oticon Medical Streamer works with the Ponto 3 and Ponto Plus sound processor families and connects with a wide range of mobile phones with built-in Bluetooth. Stream music directly to your sound processor. Make use of all the possibilities your computer has to offer for work and leisure. Stream directly or by connecting a Mini Jack cable. Use teleloops installed in theatres, lecture halls and religious services without plugging any additional device into your sound processor. Enjoy an easy way to change programs or adjust the sound processor volume. Watch TV at your preferred volume – without bothering family and friends – using the ConnectLine TV adapter. The TV adapter has a range of 30 metres. Hear speech directly through your sound processor in situations where you want to focus on one person talking. The microphone has a range of 15 metres. The ConnectLine phone adapter allows you to receive sound from your landline phone directly into your sound processor. Listen to lectures and lessons at school without plugging any additional device into your sound processor. The Oticon Medical Streamer has a built-in Europlug socket that enables an FM receiver to be attached. The ConnectLine App for iPhone®, iPad®, iPod touch® and Android™ devices can be used with the Oticon Medical Streamer. The App offers an intuitive and discreet way to control the sound processor and the ConnectLine system. It also offers the possibility to customise the features of the ConnectLine system. Available on the App Store and on Google Play™. A user guide is available to get started. *Apple, the Apple logo, iPhone®, iPad® and iPod® touch are trademarks of Apple Inc, registered in the US and other countries. App Store is a service mark of Apple Inc. Android and Google Play are trademarks of Google Inc.